A few months ago, I heard about some people trying to set up a Beer and Blog chapter here in Huntsville. The premise is simple, one a week you meet up with other bloggers. You talk. You eat. Some drink beer. It sounded like grand fun but I never heard anything more and thought it hadn't gotten off the ground. Then, in early November, I heard that they were meeting--and had been for several weeks! I made plans to attend the next meeting and promptly crashed my car leaving me with no way to get there without stranding the hubby. If you are in the area, join us! 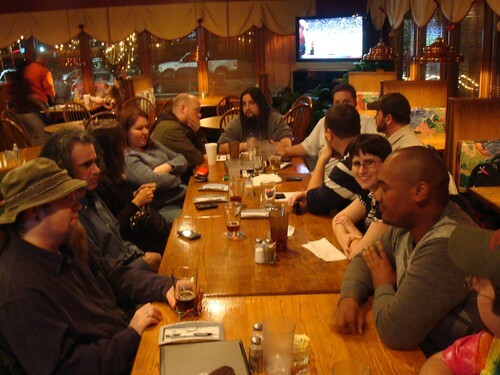 Meetings are every Tuesday from 5ish to 7ish at the West End Grill on Old Pike road. If you aren't local, check out Beer and Blog to find a chapter near you. My thanks to Andrew for nabbing the shot above at tonight's meeting!